The DRC’s Oversight Institutions: How Independent? The DRC’s oversight institutions have been actively undermined by the ruling party, dimming prospects for a genuine democratic transition. This article is the second in a series that analyzes the ongoing challenges to the democratic process in the Democratic Republic of Congo and how various actors and institutions will shape the outcome. Part 2: The DRC’s Oversight Institutions: How Independent? The Democratic Republic of the Congo’s incumbent president, Joseph Kabila, should have overseen the first-ever peaceful transfer of power in his country on December 19. However, elections planned for November were delayed, and he has stayed in office, sparking widespread concerns that the ruling party intends to try to extend Kabila’s time in power indefinitely. The ability of key institutions to serve as a check and balance on executive authority is a measure of the health of any democracy. The challenge of African leaders evading term limits is not new. Some 15 incumbents have tried since the continent started its move toward democratization in the 1990s. A determining factor as to whether they are successful is often the degree to which there are sufficiently robust institutions in place to constrain this executive ambition. The ability of key institutions to serve as a check and balance on executive authority, therefore, is a measure of the health of any democracy. This review assesses the state of such institutions in the Democratic Republic of the Congo (DRC) and their capacity for ensuring a participatory and even-handed electoral process. A representative national legislature is often the first institutional check on the executive branch. The DRC’s parliament was a creation of the Inter-Congolese Dialogue (ICD), a negotiated settlement of the 1998–2003 civil war marked by its brutality, loss of life, and intervention by neighboring countries. The ICD involved the unelected government, armed groups, political opposition, and civil society. The government was a minority in the National Assembly that emerged from these talks, controlling just 94 out of 500 seats under the terms of the agreement. The other seats went to the armed and unarmed opposition and civil society. Furthermore, the political opposition controlled the powerful office of the Speaker of the Parliament. Together with civil society, opposition parties carried a majority in the Senate, controlled seven oversight committees, and held the parliamentary and Senate secretariats established by the ICD. Vital Kamerhe is widely credited with giving all parties access to the floor and instituting open debate and rigorous oversight. Photo: Michał Koziczyński. By the end of the three-year transition, in 2006, significant gains in democratization had been made thanks to the ICD provisions. Progress continued after the elections held that year, with parliamentarians enjoying considerable independence that they used to oversee and check presidential authority. Congolese scholar Mvemba Dizolele observes that by early 2009, parliamentarians had summoned the executive to answer 43 “oral questions with debate” on a range of issues. During this time, the National Assembly and Senate established 28 independent committees to investigate misconduct by the executive branch. Then-Speaker Vital Kamerhe is widely credited with giving all parties access to the floor and instituting open debate and rigorous oversight. Unfortunately, these gains did not last. Kabila allies chipped away at the authority of parliament though various legal and administrative tasks. By mid-2009, Kamerhe was forced out after a series of disagreements with the president on the items being investigated. Following his departure, the crucial safeguards established by the ICD were dismantled. This downward spiral continued into the heated 2011 election cycle, which saw a series of efforts by the ruling party and allies to abridge constitutional limits to the advantage of the executive branch. In the run-up to those polls, for instance, Kabila loyalists forced through a raft of bills that tilted the political landscape in the president’s favor, including scrapping the provision for a two-round runoff rule, thereby enabling a presidential candidate to be elected with only a plurality of the vote. Tellingly, it sailed through parliament within a week after the return in December 2010 of the late veteran opposition leader Etienne Tshisekedi. Thousands had turned up to receive him at the airport, where he announced his bid for the presidency after years overseas. Today, Kabila’s People’s Party for Reconstruction and Development (PPRD) and its allies control 341 of the 500 seats in the National Assembly—a supermajority. This advantage was achieved following the widespread irregularities of the 2011 election, which included the “loss of results” from more than 3,000 polling stations, representing a total of more than 850,000 voters. Dizolele notes that in multiple locations in Katanga, then a Kabila stronghold, impossibly high voter turnouts—in some cases exceeding 100 percent—were recorded. Nearly all of these votes went to the incumbent. Such maneuvers continue in the ongoing crisis, further damaging the credibility of the parliamentary process. On April 14, 2016, Kabila loyalists in the parliament filed a petition at the Constitutional Court seeking clarity on three seemingly contradictory constitutional provisions. Article 70 limits the president to two five-year terms. Article 73 requires elections to be held 90 days before the expiration of the president’s mandate. And Article 75 requires the president to hand over the reins of government to the Senate president during the election. Article 70, however, states that the president’s term expires after the winner is declared and assumes office. Ruling party cadres seized on this inconsistency in taking their case before the Constitutional Court. Opposition lawmakers immediately cried foul, seeing this as an attempt to sidestep term limit provisions. Their suspicions were confirmed on May 11, 2016, when the Constitutional Court ruled that Kabila could indeed stay in office beyond the end of his mandate if the presidential election were delayed. In short, the supermajority enjoyed by the PPRD, itself realized under controversial circumstances, has negated the role that the Parliament is intended to play as a popular check on executive power in the DRC. While the notion of a Constitutional Court was introduced in the 2005 Constitution, the bill authorizing the Court wasn’t adopted by the PPRD–dominated parliament until 2010. It wasn’t until 2013 that President Kabila signed the bill into law. The Court only became fully operational in 2015—a full ten years after its creation. Three of its nine judges were selected by the Kabila-controlled parliament, three by the President himself, and the last three by the Judicial Council, a body that is staffed by Kabila allies, including the powerful President of the Supreme Court. This lack of independence has been borne out by the Court’s decisions. 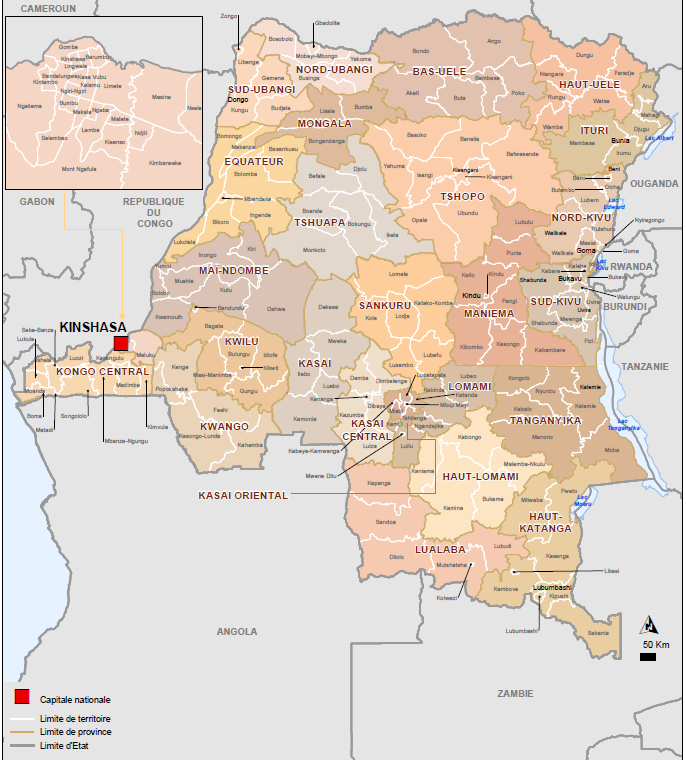 On September 8, 2015, the Court ruled that Kabila could appoint interim governors in 26 new provinces created by a 2006 constitutional provision to divide the country’s 11 provinces. The opposition contended that the appointment of interim governors was undemocratic and gave the PPRD an unfair advantage. Indeed, in March 2016, many of these presidential appointees went on to win hastily organized gubernatorial elections that opposition parties either boycotted or were excluded from. Given this track record, the Court’s ruling in May 2016 validating Kabila’s staying in office until elections could be organized was unsurprising. Provinces of the DRC. Images by Golbez and ACAPS. The Supreme Court is the other key national judicial institution in the DRC. In late August 2016, under intense pressure by civil society and the international community, the Court ordered the release of three prominent pro-democracy leaders on the grounds that the conditions of their year-long incarceration were illegal. On balance, however, the Supreme Court is viewed as partisan. In 2011, it upheld Kabila’s re-election and ruled that the opposition failed to prove its case in challenging the results. The decision increased the perception of bias among Kabila’s opponents given that in the middle of the 2011 campaign, Kabila expanded the Court from seven judges to 27. The new judges, all appointed by the president, cited the need for more manpower to handle thousands of complaints that had been filed. Opponents also criticized the new judges’ method of appointment. Under normal circumstances, Supreme Court justices are named by the president only after nomination by the Supreme Council of Magistrates. Taken together, the DRC’s judiciary suffers from the same systemic defects as the legislative branch. The dominant influence of the executive has hindered the independence of the country’s leading judicial institutions and rendered them unable to fulfill their mandate of holding the executive branch to account. The National Independent Electoral Commission (CENI) initially planned to conduct gubernatorial polls on August 31, 2015. Provincial, senatorial, and parliamentary elections would follow in the first half of 2016, and presidential elections would be held at the end of 2016. However, on September 8, 2015, the Constitutional Court ordered CENI to revise the election schedule, citing the need to “decongest the electoral calendar.” Gubernatorial polls were thus pushed back to October 25, 2015. However, these were subsequently delayed because of budget constraints. Then on March 2, 2016, the president ordered a July 30 deadline to finally implement the 2006 constitutional provision to create more provinces, a policy known as découpage. To comply with this policy, CENI held the gubernatorial elections on March 26, 2016, in what was a hastily organized and unbudgeted process that entailed re-drawing boundaries and running polls in 20 new provinces. And it led to a PPRD landslide in all but five jurisdictions, thereby increasing its control of far-flung areas. Opposition strongholds, such as Katanga—the country’s richest province, which provides 68 percent of the country’s revenue—were split up into smaller entities, thereby enabling the President to diminish the power of his political opponents. Katanga is particularly significant because it is currently the base of Moise Katumbi, the province’s popular ex-governor and former Kabila ally. Katanga was split into four localities, leading to Katumbi’s removal and the installation of four PPRD–friendly governors, all beneficiaries of découpage. Apart from increasing the ruling party’s control of key jurisdictions, this policy also virtually assured that the presidential electoral timetable would be thrown off-course. These maneuvers coincided with a series of internal troubles in CENI. In October 2015, Kabila, through a televised statement by his press office, announced the resignation of Apollinaire Malu Malu, the commission’s highly respected president, on health grounds. Although Malu Malu had been ill for several months, combined with the subsequent resignations of the CENI vice president and treasurer, his departure raised suspicions. Malu Malu was widely credited with organizing Congo’s 2006 elections (the first since the nation’s independence in 1960). He returned to CENI in 2013 after being nominated by civil society and religious bodies and appointed by the president as required by law. 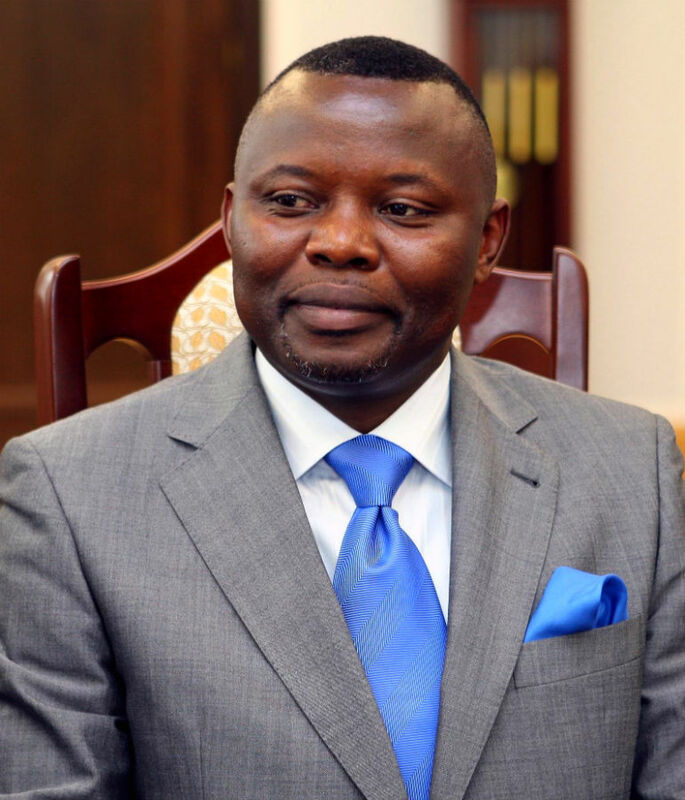 Following Malu Malu’s 2015 departure, Kabila appointed new leadership at CENI widely seen as partisan to the PPRD. In effect, the perceived politicization of the CENI leadership as well as acute resource constraints have placed the integrity and ability of CENI to oversee a fair electoral process in serious question. Meanwhile, CENI still faced an incomplete voter register as well as financial and logistical woes. In a letter that appeared shortly after Malu Malu’s resignation, the commission said that it had not received the funding allocated to it, casting more uncertainty over the elections. The commission’s resources come from the national budget which is approved annually by parliament. CENI said it had received less than 20 percent of its appropriation and was therefore unable to function properly. In February 2016, CENI abruptly cancelled a tender for the revision of the voter register citing the need to adjust the projected budget downwards. It also announced that it would need a minimum of 18 months to update the voter roll. In September 2014, dissenting ruling party members joined forces with opposition lawmakers to defeat a parliamentary motion on a referendum to delay elections. The following January they again came together to support massive popular protests that ultimately forced parliament to remove a clause in the electoral law that would have demanded a nationwide census and handed Kabila two to four extra years in power. Later in 2015 a group of seven political parties, known as G7, broke away from the ruling coalition, a move that is indicative of some dissension in the ruling party ranks and potentially a boon for opposition deputies. Coalition building among opposition parties has historically been elusive in the DRC. However, for the upcoming elections, building alliances appears to be at the heart of opposition efforts. In June 2016, opposition parties came together to plot a coordinated strategy at a retreat organized by Tshisekedi. The meeting launched le Rassemblement, or rally, which brought the main coalitions—G7, Dynamic Opposition, Alternative 2016, and Tshisekedi’s Union for Democracy and Social Progress (UDPS)—around a single platform. UDPS has a long history of opposition dating back to the Mobutu era and boasts a membership of 45 million people. Its vast mobilization capacity has played a key role in large-scale protests in several cities, including a massive “stay away” that brought Kinshasa, a sprawling city of more than 11 million people, to a virtual standstill in early August 2016. This protest was to be addressed jointly by Tshisekedi and his colleague, Katumbi, widely seen as the most serious challenger to Kabila. However, the government denied the former Katanga governor reentry to the country on his return from receiving medical attention overseas. Katumbi has since announced his determination to return home despite being convicted in absentia on charges he dismisses as politically motivated. Oversight institutions in the DRC are weak and have been actively undermined by the ruling party. The African Union’s attempts to bring opposition political parties around a table with the ruling party produced an agreement in October that was perceived as partial because it did not include le Rassemblement. For its part, the influential Catholic Church rejected the process after police fired live rounds during a major protest organized by le Rassemblement. The violence resulted in the deaths of 44 protesters. In sum, oversight institutions in the DRC are weak and have been actively undermined by the ruling party in what appears to be a systematic effort to extend or circumvent term limits. Some have characterized the process a “constitutional coup.” Given the weakness of these formal institutions, prospects for a genuine democratic transition in the DRC will rely heavily on the strength and resilience of civil society, the professionalism of the security sector, and the stance of regional and international actors. Huma Haider, “Political Economy and Governance in the Democratic Republic of Congo,” GSDRC, March, 2, 2015. Joseph Siegle, “Why Term Limits Matter for Africa,” Center for Security Studies Blog, July 3, 2015. William Clowes, “A Constitutional Coup in Congo,” Foreign Policy, May 26, 2016. Paul Nantulya, “Different Recipes, One Dish: Evading Term Limits in Africa,” Africa Center for Strategic Studies, Spotlight, July 28, 2016. Stephanie Wolters, “DRC Slip Slides into Electoral Delays,” Institute for Security Studies, March, 2016.